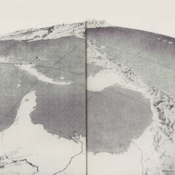 Map: "Looking Toward the Southern Americas"
image from pp.4-5 of Classroom Clipper, Vol. 1, No. 3, Dec. 1944. Left caption reads: "This unusual map shows Central America, the Caribbean area and part of South America as it would appear to you from a vantage point in the stratosphere over Texas, looking toward the southern horizon." Pan American World Airways, Inc., “Map: "Looking Toward the Southern Americas",” UM Libraries Digital Exhibits, accessed April 22, 2019, http://scholar.library.miami.edu/digital/items/show/1670.